In 1868, German immigrant William J. Seidenberg, manufacturer of the popular La Rosa Española and Buffos cigar brands, moved his factory from Cuba to Key West soon after Vicente Martinez Ybor had done the same due to the civil unrest on the island. In 1886 a fire destroyed both Key West factories, Seidenberg decided to rebuild as opposed to Martinez Ybor who decided to relocate to Tampa. After a costly strike in 1894, Seidenberg refused to employ Cuban cigarmakers any longer and proceeded to employ Spanish workers to replace them. After a lengthy Government involvement to apease the labor issues, the following year Seidenberg built this Ybor City factory building and moved from Key West. 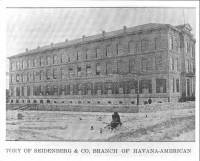 Each company continued to operate under its own name as a branch of the The Havana-American Co. until 1909 when The Havana-American Co. was taken over by American Cigar Co. , a subsidiary of American Tobacco Co. A related company often mistaken for Seidenberg & Co. is R. J. Seidenberg & Co., owned by Rudolf J. Seidenberg (1867-1931) who in 1895 established a cigar retail outlet in Buffalo, NY and eventually became a chain of 15 retail outlets in 9 Eastern cities. From 1914 to 1928 the building was occupied by the M. Valle & Co., a subsidiary of the American Cigar Co. The American Cigar Company maintained this building as a storage warehouse into the 1980s. After Seidenberg & Co. became part of The Havana-American Co., William J. established the W. J. Seidenberg & Co. headquartered in New York and became one of the largest cigar manufacturers in the United States, employing from 1,500 to 2,000 men. They had factories up and down the East Coast. On December 16, 1974, this building's then owner, the 2205 20th Street Corporation, transfered title to Universal Cigar Corporation based in New York who on December 19, 1986 transfered title to Edward Gropper. On February 18, 1994 title was again transfered, this time to Bay Brewing Co. Between the mid 1990’s and early 2000’s the factory was the home of the Ybor City Brewing Company. It was afterwards the offices of Wilson Miller and Granite Services who now occupy the Corral-Wodiska & Cia. cigar factory building. I t is currently occupied by Stantec, an architectural and engineering firm. This 36,640 square foot building was designed by C. E. parcell and constructed in 1895 but its date of construction appears as 1905 in Hillsborough County records. Its reported first tenant was the W. J. Seidenberg & Co. This picture shows the Seidenberg factory building as it looked when recently built, a strong resemblance to its current look. At one point in the building’s history, when it was used as a warehouse, all of the windows were bricked up.